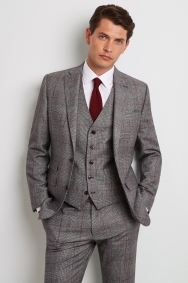 Face the week with confidence in this smart 3-piece suit by Moss 1851. Featuring a bold overcheck in black, white and red with a contrast lining for extra personality, it’s eye-catching but sophisticated enough for the office and smart events. Cut in a tailored fit and with stretch fabric, it’s designed to keep you sharp-looking and comfortable even on the busiest working days. 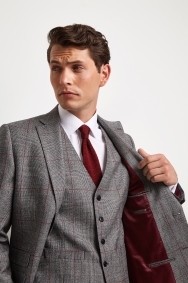 Opt for a white shirt and knitted wine tie to complete the look. 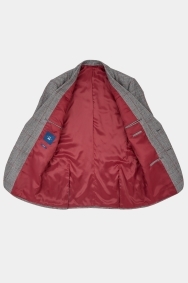 You can dress it down by simply taking out the waistcoat. 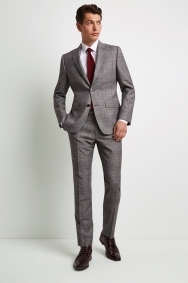 Perfect quality suit and fits very well. 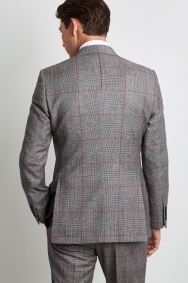 love the quality of clothes whether its shirt or pants or suits its always excellent. An excellent costomer treatments plus excellent handling of customer dissatisfaction. Picked up a suit in the sale - great value! 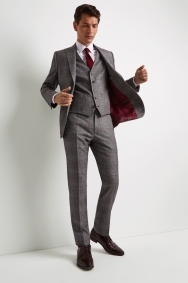 Wanted to buy a suit for a special occasion that i can use again for work. This was a good choice, Very nice suit. Excellent fitting, excellent material and very nice colour. People commented on how good it looks. Will definitely recommend.